We believe that this market volatility is indicative of a turning point in the markets. While various catalysts such as mid-term elections, the yield curve, inflation fear and the pace of Fed tightening have been proffered as the “short-term” reason for the current volatility, we see this as a fundamental repricing of forward expectations and shift to a risk off market. 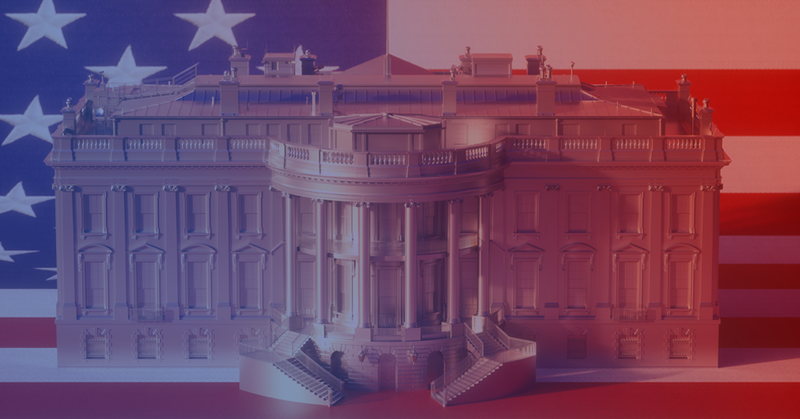 The midterm elections matter to the outlook for further fiscal stimulus. The markets are largely pricing in a changing of the guard in the House which also carries with it the promise of no further tax cuts or fiscal stimulus and the resulting reality that we are witnessing both a peak in growth and a peak in earnings. We see the steep curve as unsustainable. The curve will only remain steep if growth is stronger than expected or inflation is higher than expected, neither of which is a likely outcome which leaves the potential for continued bear flattening once this latest bout of volatility passes. The U.S. economy slowed less than expected in the third quarter as a tariff-related drop in soybean exports was partially offset by the strongest consumer spending in nearly four years. This kept growth on track to hit the Trump administration’s 3 percent target this year. Gross domestic product increased at a 3.5 percent annualized rate, supported by a surge in inventory investment and solid consumer spending. The rate was slower than the second quarter’s blockbuster 4.2 percent number, but it puts the economy on pace for its fastest annual growth in 13 years. U.S. consumer spending rose for a seventh straight month in September, while income recorded its smallest gain in more than a year on moderate wage growth, suggesting the current pace of spending is unlikely to be sustained. According to the Commerce Department, the increase in disposable income was the smallest rate in 15 months, while the savings rate dropped to the lowest level since December of last year. U.S. stocks fell in October. The S&P 500 flirted with a correction on the back of weakened tech shares following a report that the Trump administration was set to press its trade war with China. The flight to quality sentiment created strong demand for relatively higher yielding US Treasuries and the dollar rallied to near record levels not seen since 2002. The S&P 500 fell as much as 11 percent from its all-time high on Oct 26th. Selling intensified after Bloomberg reported that the U.S. is prepared to announce tariffs on all remaining Chinese imports by early December if talks next month between Presidents Trump and Xi Jinping fail to ease the trade war. American investors turn to earnings in the last days of October from tech giants Facebook Inc. and Apple Inc., along with the October jobs report on Nov. 2nd for guidance. Earnings have not been able to save other megacap tech names like Amazon, Netflix and Microsoft either. 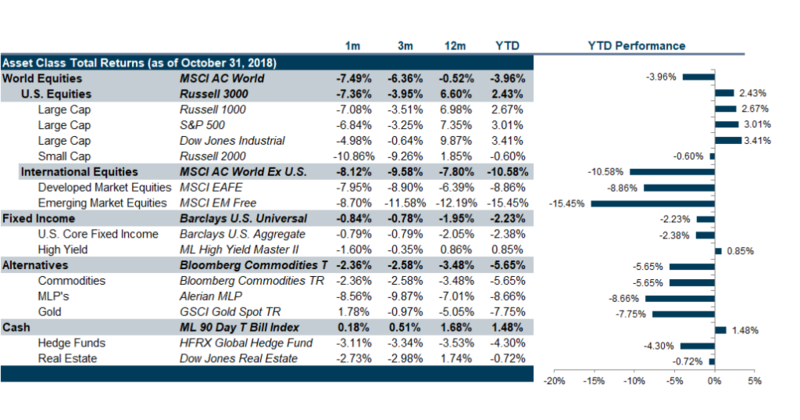 In the wake of these events, investors may see more volatility through the remainder of the U.S. earnings season and ahead of the Nov. 6 U.S. midterm congressional elections. Oil futures were little changed in October after paring earlier losses, despite Saudi Arabia’s pledge to raise crude production to a record high just two weeks before U.S. sanctions potentially choked off Iranian supplies. Saudi Energy Minister Khalid al-Falih stated that his country had no intention of unleashing a 1973-style oil embargo on Western consumers, but rather was focused on raising output to compensate for supply losses elsewhere, such as those in Iran. Falih further stated that Saudi Arabia would soon raise output to 11 million barrels per day (bpd) from the current 10.7 million bpd level adding that Riyadh had capacity to increase production to 12 million bpd. Meanwhile, several U.S. lawmakers have suggested imposing sanctions on Saudi Arabia over the killing of journalist Jamal Khashoggi. The Kingdom, the world’s largest oil exporter, pledged to retaliate against any sanctions with “bigger measures.” U.S. sanctions on Iran’s oil sector start on Nov. 4 and analysts believe up to 1.5 million bpd in supply could be at risk. On October 25th, the European Central Bank left monetary policy in the Eurozone unchanged once again, as had been expected by financial markets, leaving a base deposit rate of -0.4% and a quantitative easing program capped at €15 billion per month. Purchases were at €30 billion per month until the end of September, but the move to the lower figure had been telegraphed for several months. The ECB remains on track to cease purchasing bonds at the end of 2018 and reiterated its stance that interest rates are unlikely to rise until at least next year, saying it “expects the key ECB interest rates to remain at their present levels at least through the summer of 2019.” Earlier in October, the EU took the unprecedented step of formally rejecting Italy’s budget, which proposed pushing the country’s budget deficit as high as 2.4% of gross domestic product over the coming years. This means Italy would fall foul of a previously mandated maximum deficit level of 0.8% of GDP. China’s economic growth cooled to its weakest quarterly pace since the global financial crisis. Regulators moved quickly to calm nervous investors as a years-long campaign to tackle debt risks and the trade war with the United States began to bite. Chinese authorities are trying to navigate through numerous challenges regarding worries about the nation’s growth outlook as trade war fears have sparked a blistering selloff in domestic stock markets and a steep decline in the value of the yuan versus the dollar. The economy grew 6.5 percent in the third quarter from a year earlier, below an expected 6.6 percent rate, and slower than 6.7 percent in the second quarter. It marked the weakest quarterly growth since the depths of the global financial crisis in early 2009. The intensifying trade fight with the United States is likely to weigh more heavily on China in the coming quarters. The International Monetary Fund is downgrading its outlook for the world economy, citing rising interest rates and growing tensions over trade. The IMF said the global economy will grow 3.7 percent this year, the same as in 2017, but down from the 3.9 percent number it was forecasting in July. It slashed its outlook for the 19 countries that use the euro currency, Central and Eastern Europe, Latin America, the Middle East and Sub-Saharan Africa. The IMF expects the U.S. economy to grow 2.9 percent this year, the fastest pace since 2005 and unchanged from its July forecast. However, it predicts that U.S. growth will slow to 2.5 percent next year as the effect of the corporate tax cut wears off and as President Trump’s trade war with China takes a toll. The fund kept its forecast for growth in the Chinese economy unchanged at 6.6 percent this year. Citing the impact of U.S. taxes on Chinese imports, however, the IMF shaved the outlook for China next year to 6.2 percent which would be the country’s slowest growth since 1990. The outlook for world trade overall also darkened as the fund expects global trade to grow 4.2 percent this year, down from 5.2 percent in 2017 and from the 4.8 percent level it expected in July. In 1894, Mark Twain wrote: “October. This is one of the peculiarly dangerous months to speculate in stocks. The others are July, January, September, April, November, May, March, June, December, August, and February.” Amazing considering his novel, Pudd’nhead Wilson, predated the crashes of 1929, 1987 and 2008 which all occurred in October. Do we think markets are crashing? No. However, it’s worth noting that the VIX is elevated to the mid 20’s, while market sentiment has turned from optimism to pessimism and forward outlooks are repricing simultaneously across risk markets. Trailing and forward equity multiples are down across global regions with the US as the epicenter of the risk off behavior. High yield spreads widened more than investment grade spreads, and while the effect is still negative, it’s less painful as you go abroad with EM debt responding less sharply. US Treasuries have held up the strongest, despite a higher interest rate outlook and cash being king. While earnings have largely been positive, equity markets have been unable to rally back up to pre-October levels. More importantly, the technology sector has been unable to re-establish leadership, despite most of the tech darlings doing well in earnings season. The market used to shrug off issues that are now being highly scrutinized. And, unsurprisingly, earnings are slowing from the one-time tax cut effect. Although the expected growth rate of earnings for Q3 is projected to be 23% versus 22% for Q2 and 25% for Q1, this is still being seen for what it is: evidence that the tax cut does not actually generate additional spending. It only incentivizes demand to occur sooner. Moreover, business investment slowed to .8% in Q3 from 8.7% in Q2 and 10.4% in Q1, indicating that the bulk of corporate tax reform effects have largely been realized. Without additional stimulus, the earnings cycle in the US will slow over the next twelve months, while emerging markets company earnings are expected to pick up. This will present significant competition for capital. The continued march towards interest rate normalization at the front end of the curve has finally been met with a sharp move in the long end of the curve. Perhaps a spark that lit the kindling alight in early October, the long end has remained persistently high through the month despite downward pressure in the form of flight to safety. The belly of the curve has retraced back to near pre-October levels, creating a bow effect, but the two-, five-, and seven-year tenors are all dramatically higher. And, despite this flight to quality, the bond markets have held up admirably this month, suggesting that we are at the beginning of a risk-off cycle. While this kind of action is more indicative of the end of an expansion just before the economy cycle slows, we are not quite sure that is the case. So, this could be an overreaction to the political concerns. We could, in fact, see another “dead cat bounce” early in 2019 before the markets resign themselves to the idea that the best has happened and we are now headed for a slowdown. But, bonds as an investment are still a solid source of protection when volatility rises in the market. That is, until their creditworthiness is called into question, but we will leave that for another chapter. We remain neutral in equities across geographies and size, however, we remain overweight value equity. We remain neutral EM debt despite the recent rally, though flag this as a continuing opportunity for shorter-term oriented investors. We are neutral overall in fixed income, neutral Treasuries, neutral investment grade and overweight higher quality high yield and cash.